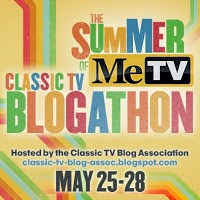 Note: This review is part of the 2015 Summer of MeTV Classic TV Blogathon hosted by the Classic TV Blog Association. Click here to check out this blogathon's complete schedule. Writing about the original Star Trek in 2015 is like writing about The Beatles or The Wizard of Oz or sunlight. Everybody knows what it is, thousands of other people have already written about it, and at this point there doesn’t seem much left to add. 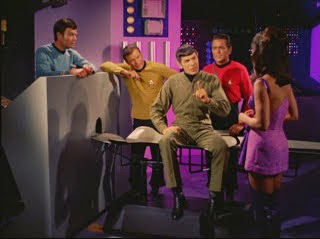 So rather than offer yet another tribute to the vision of Gene Roddenberry, or more praise for the show’s forward-thinking philosophy on race and class and technological achievement, and its optimistic view of mankind’s future, I thought it would be a more interesting challenge to find something praiseworthy in what is regarded by fans as the series’ worst episode. That would be “Spock’s Brain,” the show that kicked off Star Trek’s third and final season. "Frankly during the entire shooting of that episode, I was embarrassed," was Leonard Nimoy’s recollection. And if you’ve heard his singing on “The Ballad of Bilbo Baggins,” you know he doesn’t embarrass easily. Was it justified? Let’s find out. Our story begins with the Enterprise approaching a mysterious alien craft. Before Captain Kirk can inquire if there might be any attractive young women aboard, one actually beams over, incapacitates the crew and then walks over to Spock and begins stroking his forehead. “If it was taken out, it can be put back in.” Kirk responds, showing the quick thinking that made him a Captain. But McCoy warns that the procedure must be performed within 24 hours. Because, apparently, a body can’t survive without a brain for more than a day, unless it belongs to a Kardashian. Thus begins the quest to reunite Spock’s brain with the rest of him, which requires the crew to beam down to a planet populated by cavemen wearing fuzzy blue skirts. Sound ridiculous? Absolutely. But the next time this episode airs on MeTV and you’re tempted to change the channel, here are five reasons why “Spock’s Brain” is worth your time. Every Trekker has his (or her) William Shatner-as-Kirk impression, complete with convulsive body movements, random pauses between words and other assorted histrionics. The thing is, you don’t see that Shatner in “The Space Seed” or “City on the Edge of Forever,” when the story could stand on its own merits. It was only when the script was lacking that he would try to forcibly inject some drama into substandard material. So when Uhura asks Kirk why someone would steal a brain, Kirk responds, “Yes…why…would…they…want it?” “Spock’s Brain” needs all the help it can get, and Shatner is happy to oblige. As classic TV drinking games go, it’s hard to top the one for The Bob Newhart Show, in which participants drink every time a character utters the phrase “Hi Bob!” “Spock’s Brain” offers a variation on that theme: Count the number of times “Spock’s brain” is said by Kirk, McCoy and Uhura. If you’re drinking anything alcoholic, you’ll certainly start enjoying the show at some point. The reign of “Spock’s Brain” as the worst moment in Star Trek history ended in 1995. That’s when Voyager released “Threshold,” in which Captain Janeway and Tom Paris were turned into salamanders and had reptile babies. After that, this episode seems almost quaint in its silliness. And here is one bonus reason to stay tuned: even substandard Star Trek is better than any episode of Dating Naked, Honey Boo Boo, The Real Housewives of Lompoc and much of today’s television, for which brains are also optional. So glad you mentioned Marj Dusay, who was a member of the L.A. comedy improv group The Session. That group also included, at various times, Rob Reiner, Richard Dreyfus, and Bobbi Shaw (from the Beach Party movies). She was always a worthy guest. As for this ST episode, it certainly wasn't one of the best, but I can't argue with your five reasons to watch it (well, actually I haven't seen that episode of VOYAGER...but it sounds pretty bad). Thanks for a fresh, amusing take of an episode of a classic series! Rick29, did you ever see Marj Dusay on the daytime serial "Santa Barbara"? She was also on "Guiding Light" and "All My Children." Marcy Walker worked on all three of those soaps. As for "Star Trek: Voyager," it is worth noting that Kate Mulgrew became popular on the daytime drama "Ryan's Hope" during the 1970s. You had me at Marj Dusay. Me, too. I always thought she was especially good on Hogan's Heroes. Amanda By Night, did YOU ever see Marj Dusay on "Santa Barbara"? If not, did you see her on any other daytime soaps? Sorry if I'm being annoying, Mr. Hofstede, but daytime dramas too often get slighted. I don't think either "I Love the '90s" or "I Love the '90s: Part Deux" (both VH1 shows) brought up the infamous "Day of our Lives" storyline from 1994-95 where the beloved heroine Marlena got possessed by a demon. 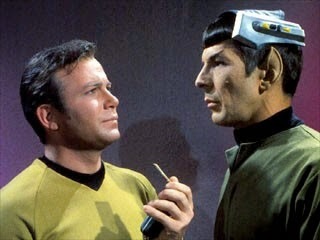 As a kid, "Spock's Brain" was one of my favorite episodes. It wasn't until I mentioned how much I liked it to others and got strange looks that I realized some folks weren't as enamored as I was. In fact, I used to get those same looks when I would tell everyone how much I enjoyed the Doctor Who serial "The Gunfighters." Excellent article. I'm trying that drinking game now! Very fun post with great points in favor of "Spock's Brain"! There's something endearing about the way third season "Star Trek" can provide plenty of entertainment while not being like the first two in terms of overall quality. Everything feels different and yet...the guys are such pros that they make it work. "Spock's Brain" also has a catchy musical score that keeps you going and those ladies are like Eloi maidens but more colorful. The episode may not be held up as the best of classic Trek but it's sure enjoyable if you relax and go along with it! I agree - season 3 does require a lowering of expectations, but even the most difficult shows have their moments. Very fun post! "Spock's Brain" is no great shakes as an episode of STAR TREK, but it can be fun to watch if taken in the right spirit. I like that you give Shatner his due...he might be guilty of overacting at times, but it was usually for a good reason, as you say. Also got to love those occasional SUPERFRIENDS-style "everybody laughs" endings that the original series did. And I'll take "Spock's Brain" any day of the week over VOYAGER. Voyager's not so bad, 'Threshold' and the odd Harry Kim episode aside. I just find that whole fictional universe to be a very pleasant and interesting place to visit, whether it's the original series or any that followed. I really enjoyed your article and the laughs it gave me -- I am a true original Star Trek LOVER, and you did such an amusing take on it. Great job! Thank you Becky - and BTW I always enjoyed your Journey of a 21st Century Catholic blog. What a fun way to approach talking about Star Trek! You pulled out all the stops on the comedy writing here too. My favorite line: "And if you’ve heard his singing on “The Ballad of Bilbo Baggins,” you know he doesn’t embarrass easily." I'm proud to be a Star Trek fan--glad to see I'm in good company. I wouldn't even know how to relate to anyone that wasn't a Trek fan, Joanna. Late to this party...but I would like to nominate "The Kardashians" as the alien threat for whatever the next Star Trek iteration might be.